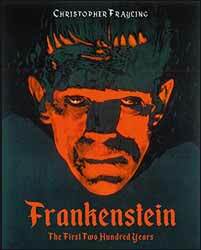 Most Reel Art Press releases Frankenstein – The First Two Hundred Years, by Christopher Frayling. It is an 11 x 9 inch full colour hardcover book chronicling the classic patchwork monster in all forms of media. There are more than 200 images, many of them full page. Mary Shelley’s Frankenstein – like Bram Stoker’s Dracula – is an ageless horror/science fiction/moral tale which has resounded through the ages. Ask anyone to name a well-known horror novel and this one is likely to get a mention in most cases. It first saw the light of day in 1818 but it wasn’t until the tale was adapted as a stage play that it captured the public imagination. Since then there has been more than ninety adaptations alone between 1931 and 2016. Of course, the iconic image most people still relate to is the Universal Pictures black and white version starring Boris Karloff. But that is just the tip of the iceberg; this book covers Universal sequels, Hammer Films, and more modern representations. Furthermore, stage plays are covered, as are advertisements and even pastiche. Some people might have forgotten The Munsters, for example; but who could forget The Rocky Horror Picture Show which incorporates Frank N Furter (played brilliantly by Tim Curry) who creates a muscle man in his laboratory. The first thing that draws me to this book is the smell. There is nothing like the smell of a newly printed hardback book. Other true bibliophiles will agree with me, I’m sure. The history of the Frankenstein scenario is a compelling one. Even so, it could very well have been heavy-going. I was ready to dip in and out of it, as you might with most reference works. However, the narrative doesn’t bog you down, preferring instead to offer only the facts. It’s a lovely touch to see Mary Shelley’s original handwriting for the creation scene. Where this tome really succeeds though is through the quality of its images. Full page glossy photos of Karloff’s Frankenstein monster, Bride of Frankenstein, Der Golem, Robert De Niro’s creature from the Kenneth Branagh directed Mary Shelley’s Frankenstein, The Curse of Frankenstein with Christopher Lee as the monster, Mel Brooks’ Young Frankenstein, the 2011 stage play with Benedict Cumberbatch, and even Abbot and Costello Meet Frankenstein. A very well presented book.